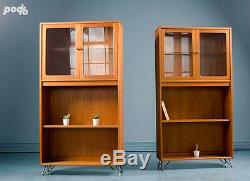 Vintage Mid Century Retro G Plan Fresco Bookcase Display Cabinet Sideboard Teak 1960/70. 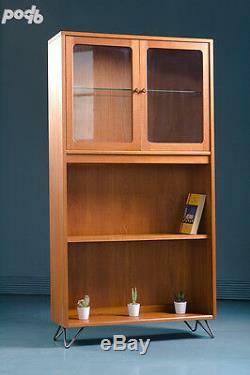 This is a vintage G-Plan display drink cabinet book case dating from late 60s and early 70s. It has been reclaimed from a G Plan Fresco range and it is in a fantastic original condition that was enhanced by a light but detailed refurbishment and application of teak and danish oil to protect it and bring out the color and the grain. The very best materials were used in making it available at this period. It was expertly made out of exotic timers mostly Burmese teak. The cuts were carefully chosen to accentuate the wood figuring and grain. It has 3 shelves , 2 of which are adjustable/removable and a fixed one which still has lighting fixture built in so the lighting could be enabled. It is stood on a set of sturdy handmade steel hairpin legs. We are very happy to report that there are no problems with the cabinet it is fully functional and very attractive with very little signs of damage or wear. This item is quite heavy and you will need to be willing (able and fit) to assist the driver with getting it into your premises. It is your responsibility to ensure items fit through doorways etc. The item "Vintage G Plan Mid Century Retro Teak Book Case Glass Display Cabinet Shelves" is in sale since Friday, January 25, 2019. This item is in the category "Home, Furniture & DIY\Furniture\Bookcases, Shelving & Storage". The seller is "happypea1968" and is located in MANCHESTER, Cheshire.